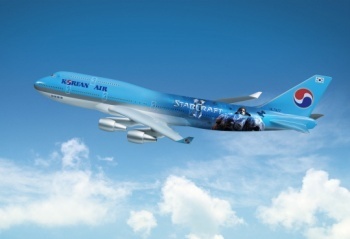 Blizzard and Korean Air have signed a deal for one of the biggest videogame advertising campaigns of all time: StarCraft 2-branded 747 airliners. Most videogame companies that want to advertise a new game will come up with a few online ads, one or two for gaming mags and maybe, if the budget is there, a television spot: Part of a cut scene, a bit of gameplay action, some narration and it's ready to go. Blizzard, however, isn't most videogame companies, so when it came time to advertise StarCraft 2 in Korea, it took a bit of a different approach and branded not just one, but two - yes, two - entire 747s. The StarCraft jets will operate within Korea, naturally, and will also fly to North America and Europe. Blizzard said the ads are a "huge opportunity" to get the word out about StarCraft 2, while Korean Air apparently sees them as a way to appeal to a younger generation of fliers in a country that has a powerful "thing" for StarCraft, with professional players and teams, major sponsorships and even televised competitions. Clearly, the next logical step is to replace in-flight movies on the two planes with in-flight StarCraft tournaments. And if nobody at Korean Air has thought of that yet, consider it a freebie from your friends at The Escapist.